The official start to summer. Wedding season. The longest day of the year. Graduations. Tons of races and sports celebrations like Boulder’s Walk and Bike Month and Chicago’s Bike to Work Week (who says you can’t carry over May’s cycling celebrations?). National Trails Day. Father’s Day. Yeah, that’s June. But what I didn’t know until someone told me is that the year’s sixth month does more than celebrate the men who are dads. The week before Dad’s big day has been named Men’s Health Week, but it turns out that the entire month of June is all about men’s health. Makes sense—and is only fair—with women’s health celebrated for a week in May. Who knew? Real Ryder Revolution did—and they’re suggesting that men come ride with them all month long. 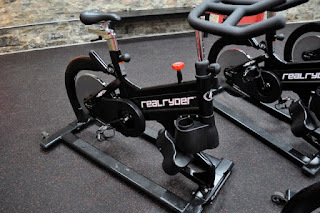 I already got excited about Real Ryder Revolution last month when the newish indoor cycling studio in Chicago was offering a deal I couldn’t refuse (well, I really can’t refuse any fitness bargain unless I forget to buy it by the deal deadline, which is known to happen). But it’s not a good deal that’s the reason to ride at River North's R3—though until June 7 you can buy a 3-month summer unlimited package for $300. It’s the added bonus to all the sweating, strength-building and sculpting offered in every R3 class. The best—and perhaps easiest—way to describe R3? Spinning on steroids. Seriously. For starters, these aren’t your usual stationary bikes. 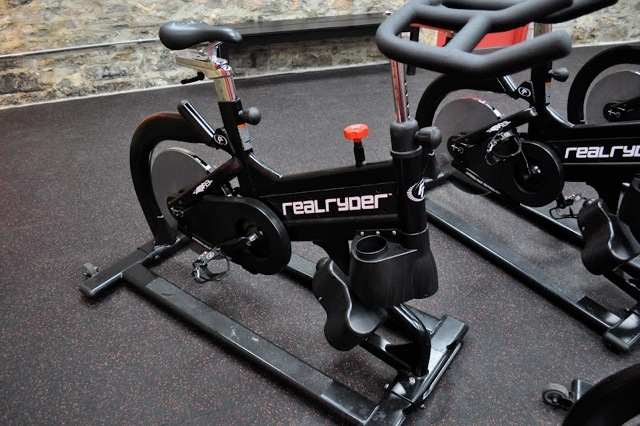 The Real Ryder bikes move, simulating the motion of outdoor riding while providing a full-body cardio workout. That means increased cardiovascular fitness, improved muscular endurance and shaped muscles in a workout that promises to burn 700 to 1,000 calories per ryde. Lats and arms sore from a Spinning workout? That’s never happened to me before…until I rode at R3 and had to take a break from the standing and leaning we were instructed to do because my arms and lats were silently screaming for me to stop their pain. And core strength that doesn’t come from crunches, yoga or physical therapy, all spots where I’ve had to harness it before? R3 nails it. It’s also believed that the bikes help improve attitude and elevate mood, but that could be attributed just as much to the class itself. To borrow a popular quote from Legally Blonde, exercise boosts endorphins. The instructors keep the energy going from the time you start the blood pumping to when you cool down. The movie screen transports you to vistas you’re not going to find riding around Chicago—I got a taste of the southwest on a cold, grey, rainy Windy City evening. And if you’ve ever tried to ride your bike on the Lakefront Path once the temperatures heat up, you know it’s doable but difficult when you’re dodging runners, walkers, inline skaters, leisure cyclists (and those darn pedal pushers that circulate Navy Pier), flying volleyballs and random traffic. You won’t have to slam on the brakes when you’re riding indoors, and you don’t have to put your workout on hold when it’s pouring rain, so windy you’re dreading the headwinds, or your bike’s in the shop getting a tune up or in transit as it returns from a race. I could continue listing the reasons not to ride outside—probably because I’m so good at avoiding the path—but I’ll leave it at that. Ready to try leaning, steering, climbing, racing and chiseling your physique at R3? Check out the studio's latest schedule here and then drop in for a ryde at 108 W. Hubbard. Have you tried the Real Ryder bikes...what's your take on the R3 experience? Yes! Bart Yasso Runs Chicago...Today! Can You Name Rock 'n' Roll Chicago's Headliner? Got Soul--And Sole? Share Your Shoes.